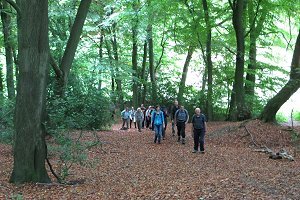 Twenty-three people came to Mike's walk on Saturday 5th October. Nine of these were new to the group and trying us out for the first time. The formula of a short walk, not too far from Reading seemed to attract a record number of newbies. We set off at just after 11am from Sonning Common, heading north-east toward Blounts Court. 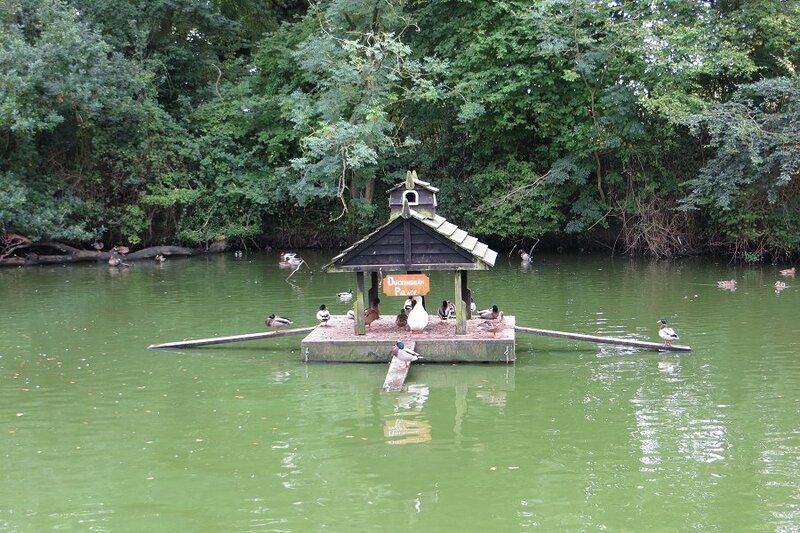 On the way we passed a large duck pond by Widmore Lane with a shelter on an island called Duckingham Palace! 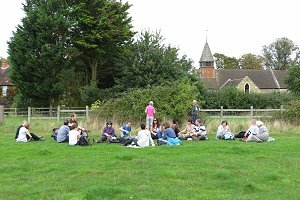 Having our picnic lunch behind the church in Rotherfield Greys. 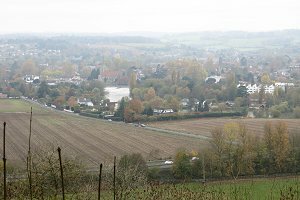 From there we continued north-east across a number of fields and through woodlands to the small but pretty village of Rotherfield Greys. Despite only being a five mile walk there was a picnic lunch stop and pub stop included. The picnic stop came first, in a field behind the well kept Norman Church of St Nicholas. As there were so many of us on this walk, we headed off to the village pub in dribs and drabs after finishing our packed lunches, to prevent us creating a massive queue at the bar! Walking through the woods on our way back to Sonning Common. The pub had a pleasant garden at the back where most of us sat while drinking tea, coffee or beer, and watching the occasional apple fall from the trees. After our refreshments, we doubled back past the church and crossed the field we had our lunch in, to join the Chiltern Way. 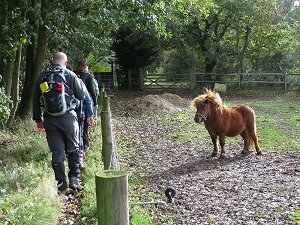 We didn't stay on it long before heading south-west across more fields and woodlands on our way back to Sonning Common. I'm afraid I forgot to switch on my GPS receiver when we started the walk so there's no map of our route, but I expect that if you ask Mike nicely, he'll be able to show you the route of the walk. 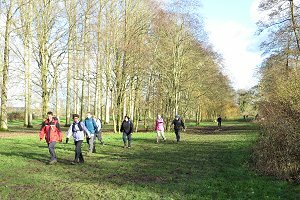 Dan, from the Berkshire Walkers 20s & 30s group had recently led a nine mile walk for his group around the Christmas Common area of South Oxfordshire. The walk was well liked so he volunteered to lead it again for our group, which was very kind of him. The forecast wasn't good for Sunday 13th October, and it wasn't wrong. As I drove across Reading and then into Oxfordshire on my way to Christmas Common, the rain continued to get heavier and was absolutely chucking it down when I arrived. There didn't seem to be many other cars in the car park - I had got there a little early - so I sat in the car hoping that the rain would ease up. It didn't! 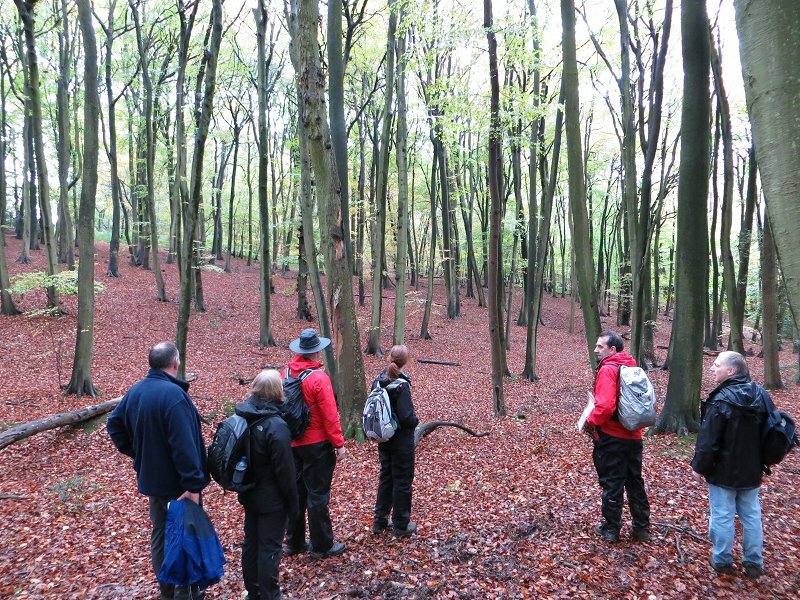 Surprisingly we had seven people turn up to this walk, despite the terrible weather. Suitably clad in waterproof jackets and over-trousers, we headed off easterly from the car park. We passed through Shotridge Wood and Blackmoor Wood, which gave us some shelter, before emerging into the open fields near Ibstone Common. Here there was an impressive view of the trees in the distance disappearing into low cloud. Due to the poor light and the chance of water damage to my camera, I didn't take any photographs on this walk. Sorry! We turned north and headed across open fields toward Wellground Farm and Hailey Wood, where we began to get close the the M40 motorway. We turned north-westerly and found somewhere to stop for lunch in the woods. The trees were saturated by now and gave little shelter from the rain so some skill was involved in keeping sandwiches dry while trying to eat them. Coming out of the woods on a high ridge running parallel to the M40, the rain began to ease off but we felt the effect of the cold wind on our wet clothes. Brrr! 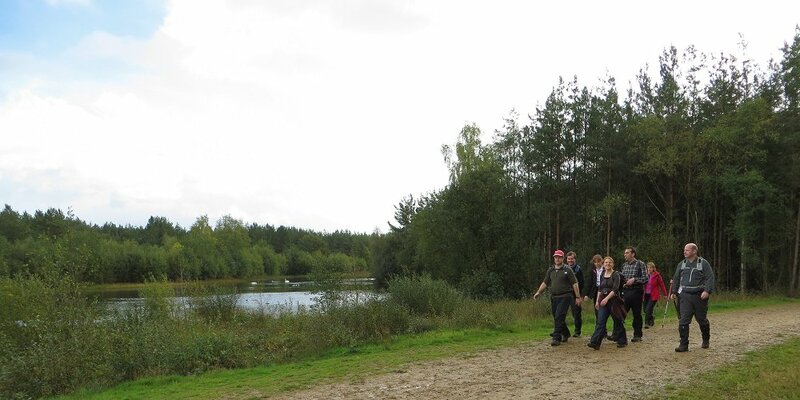 We then joined an established path called Swan's Way. This is part of the Icknield Way, an ancient track that goes from Wiltshire to Norfolk. We followed this for a couple of miles until it intersected with the Oxfordshire Way, which we then followed back to Christmas Common. Three of our party headed straight back to the car park while the remaining four visited the local pub, which had a quarry-tiled floor and an open fire. 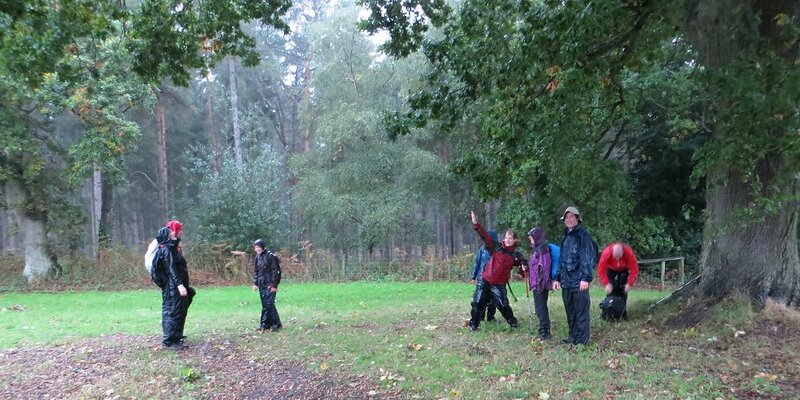 Ideal for wet ramblers! I recorded most of the route on my GPS but the first part is missing due to the receiver struggling to acquire any satellites in the very heavy rain. The very last part of the route is also missing as I switched off the receiver when we got to the pub. See the recorded part of our route on Bing Maps. Walking through Bramshill Plantation. Blue sky at the moment. Tim led his second walk for us on Sunday 20th. Nine of us turned up, despite a doubtful weather forecast, and were greeted by some wet dogs and their (mostly) apologetic owners. We set off from a car park at the south-eastern corner of Bramshill Plantation and headed more-or-less north-west along well-maintained footpaths through the plantation. The intermittent sunlight sparkled on the recently showered grass and trees. Leaving the plantation, we found ourselves in familiar surroundings. Some of us had been here before on the recent walk along the Wokingham Way. We crossed the river Blackwater and in doing so, crossed from Hampshire into Berkshire. En route to Farley Hill. The blue sky has gone and the waterproofs are going on. Now heading east, roughly parallel to the Blackwater, we lost sight of the sun and felt the first of several short showers. Umbrellas were soon erected and waterproof jackets donned as we carried on, passing some patient fishermen by a small lake at Jouldings Farm. We followed a lane up to Farley Hill village where I recognised a house that had once been a pub. I stopped for a drink there on a walk many years ago. Taking a narrow footpath out of the village we descended into Bulloway's Farm. There we crossed what had been a corn (or maize) field a couple of weeks back, when the leader had done his recce. Now the field was bare and the course of the footpath had been erased. It took us a little time to find the exit that would take us through woodland and along a quiet lane to a ford and a bridge over the river Blackwater. We stopped at the ford and bridge over the Blackwater at New Mill Sluice. Stopping for our picnic lunch in a small grassy area by the river, we could see two fishermen casting into the Blackwater by New Mill Sluice. We didn't see them catch anything during the time we were there. 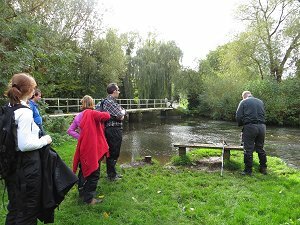 After lunch we crossed the river, back into Hampshire, and headed toward the village of Eversley and the White Hart pub. The weather was on the turn again as we got to the pub and we were only half-way through our drinks when the thunder and lightning started. Then followed the rain, getting heavier by the minute. Eventually we couldn't delay the walk any longer and we set off, with one of the locals withing us Good luck! . Just crossing the roads was hazardous enough, with passing cars throwing up great bow waves as they drove through the deep surface water. Sheltering under an old oak tree near Warren Farm. Our waterproofs tested to the limit. There was more thunder and lightning as we made our way south from Eversley. I have to say it was impressive! The lightning is so much brighter and the thunder sounds amazing when you're outside. With no sign of the rain letting up, we took a group decision for the leader to use a short-cut back to the car park. Taking a fairly direct route west through Warren Farm and Heath Warren Wood, we emerged opposite the plantation where we had started. The car park looked rather empty, with no sign of any dog walkers now. We'd had an enjoyable walk, despite the heavy weather at the end. See our route on Bing Maps. 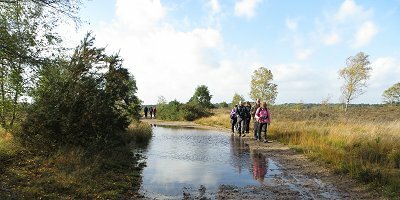 There were some large puddles on the footpaths on Chobham Common. Sunday 27th October was the day before the night of the Big Storm of 2013. Ten of us plus two from a neighbouring walking group turned up on this windy day for a ten mile walk. Setting off from the Chobham Common car park on the north side of the M3 motorway, we made our way east and then south, crossing over the B386 and then under the motorway. 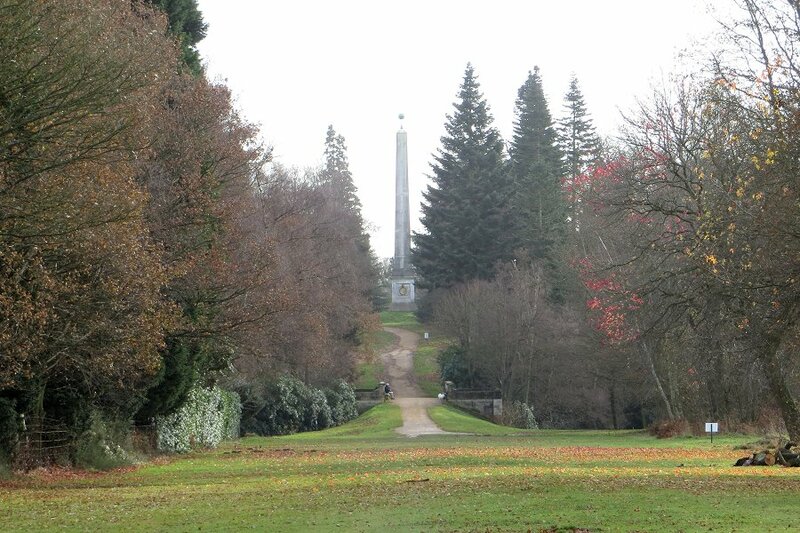 From there, we zigzagged across the common, making our way toward Stanners Hill. There was a reasonable amount of woodland on this walk. Much of the common was waterlogged from the recent rain and some of the paths required a little paddling. We stopped off for our picnic lunch in woodland near Stanners Hill where we found some logs to sit on. 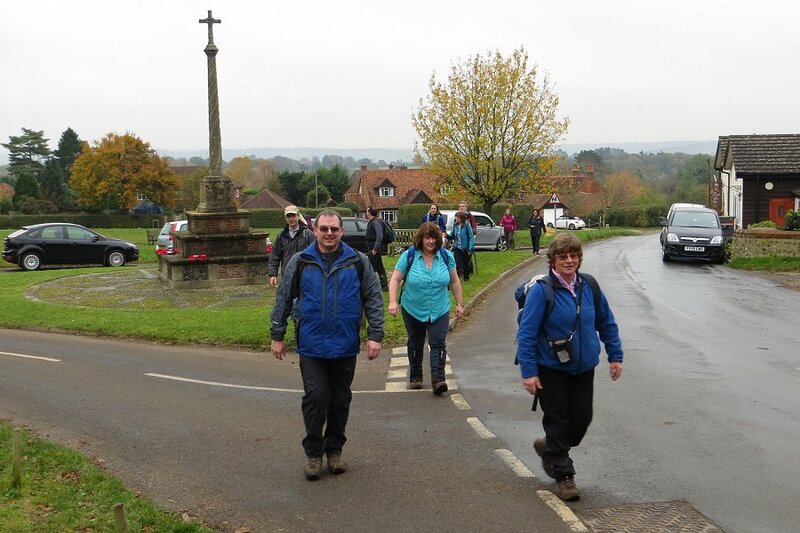 After lunch we continued our walk across farmland to Chobham village. On the way we passed a field of horses that wanted to follow us on our route out of their field and we passed another field with two of the shortest miniature ponies I've seen. Next a bit of urban walking took us through the village to the nearby Burrows Hill, where we stopped at the Four Horseshoes pub for a drink. 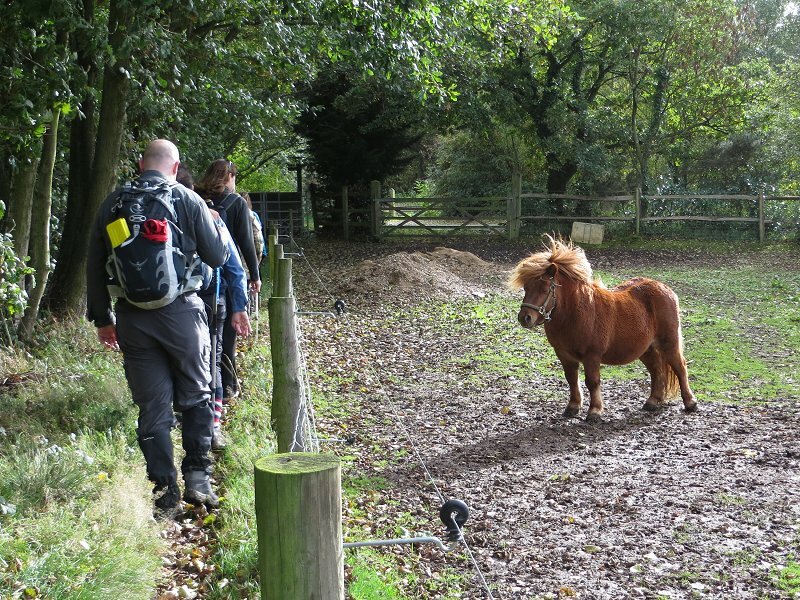 On the way to Chobham village we passed a field of miniature ponies. Although it was rather windy, it was still warm enough to sit outside. At one point we witnessed the parasol from a nearby table take off and fly across the car park, narrowly missing a couple who had just arrived! On finishing our drinks, we set off following mostly woodland paths taking us north towards Chickabiddy Hill, one of the few high points on the common. From there you can see most of the common and you can see the busy M3 motorway bisecting it. We made our way back to the pedestrian underpass, where we'd crossed under the M3 in the morning. Then we retraced our path over the B386 and almost back to the car park. From Chickabiddy Hill you can see the M3 motorway dividing the common. A choice was offered: to head back to the car park and finish the walk early, or to carry on for another couple of miles over Oystershell Hill and Ship Hill. 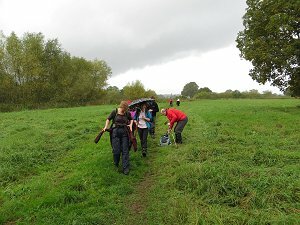 Most chose to return to the cars and get home before the weather turned bad, as it was forecast to do, but a few of us decided to risk it and get a bit more exercise. Exercise indeed, as the 20m (65ft) of ascent was brief but steep. The path had been terraced into giant steps that required some momentum to climb. The views rewarded us at the top. The route down Oystershell hill was shallower, and Ship Hill was easier still. The sky now much more cloudy than before and the wind making its presence felt, we got back to the cars in plenty of time before the sun set and the evening rain began. See our route on Bing maps. We had an extra guest on today's walk. A parrot that couldn't fly! 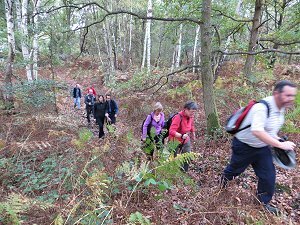 Fourteen of us turned up on Saturday 2nd November for a six mile walk from Stanford Dingley. It was quite mild for the time of year and the rain held off until the end of the walk. 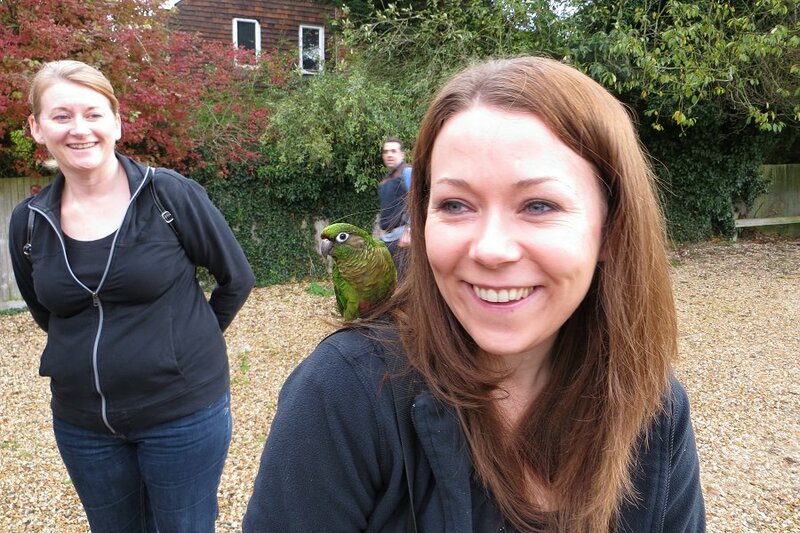 As well as a few members of neighbouring walking groups joining us, we had an unusual special guest - a parrot! 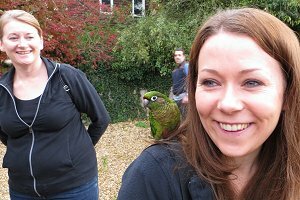 This parrot was slightly disabled and unable to fly, but seemed quite content to sit on its owner's shoulder and enjoy the views on this walk. Setting off from outside the Old Boot Inn in Stanford Dingley, we headed north through the village and then east past the church. Heading north again once we'd reached Frogmoor Farm, we made our way up toward Bradfield House and into woodlands. Not exactly single file! 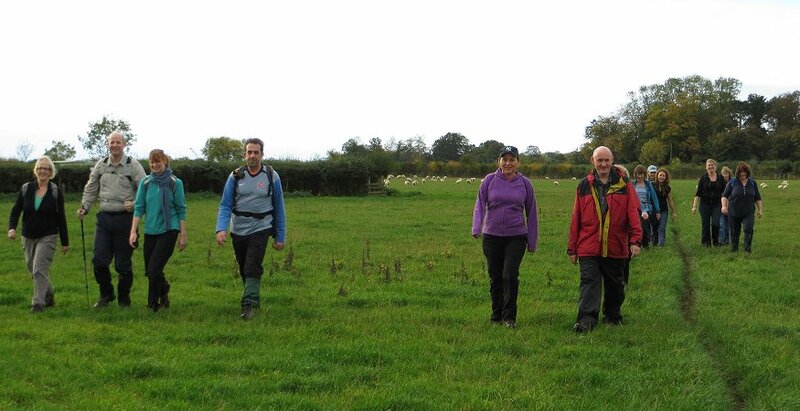 Walking through a sheep field on Home Farm. Winding our way through the woodland and crossing a few contour lines as we went, we emerged heading east toward Home Farm and Bradfield village. The village itself sits on the River Pang and is home to Bradfield College public school. Part of the village was divided by the river and we saw a row of cottages where each front garden had its own bridge crossing the Pang to access the road. Following the footpath by the River Pang at Bradfield. We skirted the school and followed the footpath along the path of the Pang. The footpath diverged from the river but continued south-westward, passing Bradfield Hall and the watercress beds, eventually taking us back to Stanford Dingley and the Old Boot Inn. At the end of the walk most of us stopped off at the pub for drinks and lunch. Our walk leader had arranged with the landlord to reserve a table for us in this splendid 18th century pub with its open log fire. We were warm and dry inside when the heavens opened outside. (The rain conveniently stopped before we left the pub.) You can see our route on Bing maps. Our route took us past Greys Court. A National Trust property. Seven of us turned up on this rather wet Saturday in November. The rain was already coming down quite heavily as we started the walk, but in contradiction to forecast, it slowly eased up during the day. Setting off from Peppard Common, we headed north easterly past the golf course at Bolt's Cross on our way to Greys Green. For some of this part of the route we found two paths running parallel. Eventually we worked out why there were two paths. One was a pedestrian footpath and the other was a bridal way. We had started off on the bridal way but as it got more muddy and churned up, we crossed over to the other path through a break in the fence. A nice mixture of colours on show in the woods near Satwell. Where is the footpath? It wasn't long before we were passing the manor house of Greys Court. From there we took a route passing through woodland and farmland that slowly curved round to a westerly direction. About half way between Bromsden Farm and Lower Highmoor, we stopped for our picnic lunch. The rain had eased up a bit and we found a fallen tree to use as a bench to sit on while we ate our packed lunches. After lunch we continued west to Lower Highmoor, where we took a sharp left turn and headed south. This took us through Holly Grove to Satwell where the Lamb pub resides. This pub has been closed for many months (maybe more than a year) but I couldn't help notice that the sign outside the pub looked rather new. Perhaps the pub is about to re-open? I hope so. We've seen too many country pubs close down in the last few years. 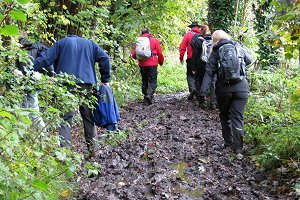 There were some waterlogged paths to contend with along the route back. We continued south through boggy woodland on our way back to Peppard Common, except for the very last stretch, which was on a quiet lane. There was some long grass at the side of the lane, which cleaned our boots as we walked through it. At the end of the walk, four of us decided to visit the local pub for a drink before going home. See our route on Bing maps. A view of Marlow from Quarry Wood, near Cookham Dean. 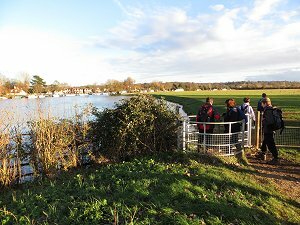 Sunday 17th November saw twelve of us meeting at Cookham station in anticipation of a short 6½ mile walk. 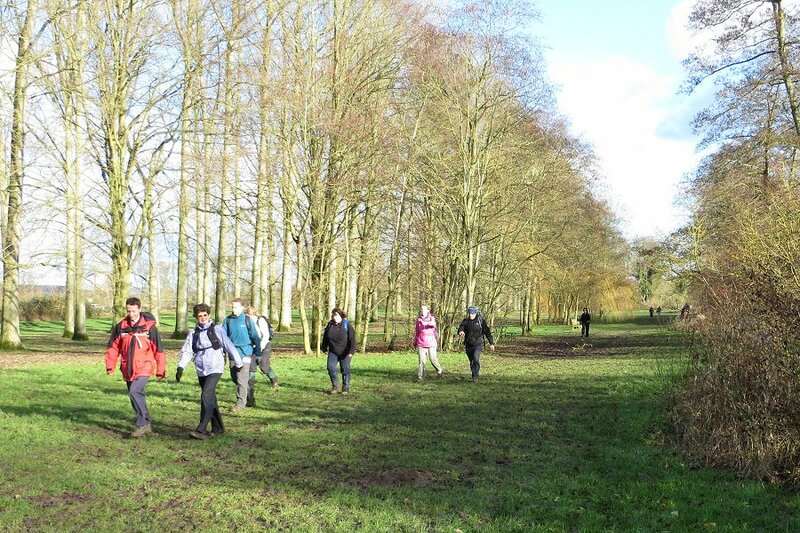 Although this walk was held jointly with the Berkshire Walkers 20s & 30s group, none of them were there. However, we were joined by several guests from other walking groups. Starting from the station and walking west through Cookham and Cookham Dean, we were soon out in the countryside and ascending Mount Hill, our first hill of the walk. This walk had a total of around 200m (650ft) of ascent (and therefore descent) on its route. Entering Cookham Dean on the way to the pub. The weather wasn't particularly warm but it was rather humid and we were soon taking jackets off during the first uphill section. From Mount Hill we descended into Cookhamdean Common and then up through Park Farm into Park Wood. We continued along the wooded ridgeway passing through The Hockett and Quarry Wood, making a couple of slight detours along the way. Between The Hockett and Quarry Wood there was a particularly steep descent on a muddy path that tested our skill and balance. 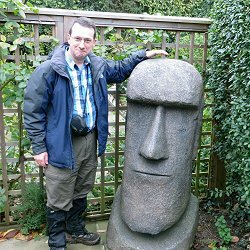 Who's that big-head in the garden of the Jolly Farmer? Further along the ridgeway we stopped for our picnic lunch before continuing to Winter Hill. The jackets were going back on now as stopping still on this high vantage point for lunch had reminded us that it wasn't really a warm day. At Winter Hill we turned south, descending from the ridgeway before ascending back to the village of Cookham Dean, where we stopped at the Jolly Farmer for a drink. 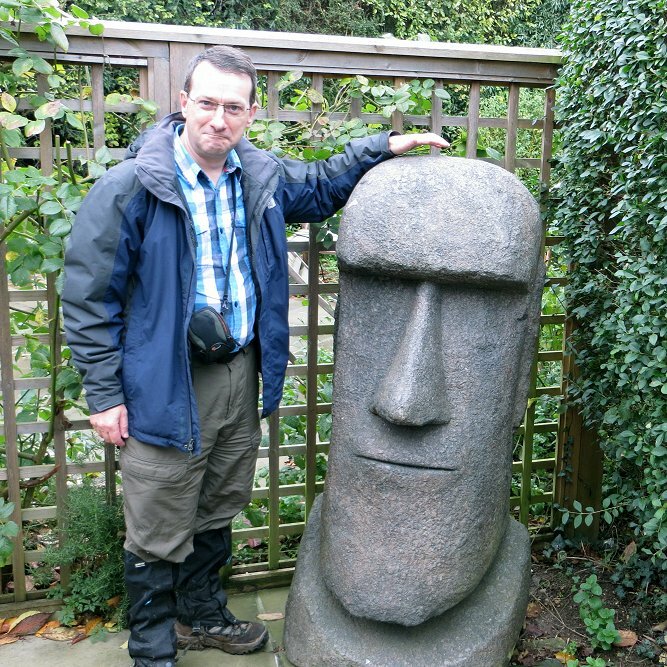 The pub had a rather unusual granite sculpture head in its garden, which resembled those on Easter Island. It also had a friendly pub dog, who kept us company outside without demanding too much attention. After finishing our drinks and making use of the facilities, we set off retracing our steps back to Cookham station, descending about 70m (230ft) in the process. 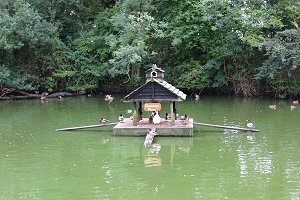 For a relatively short walk, we certainly got some good exercise and it was well worth the trip to this north-easternmost corner of Berkshire. 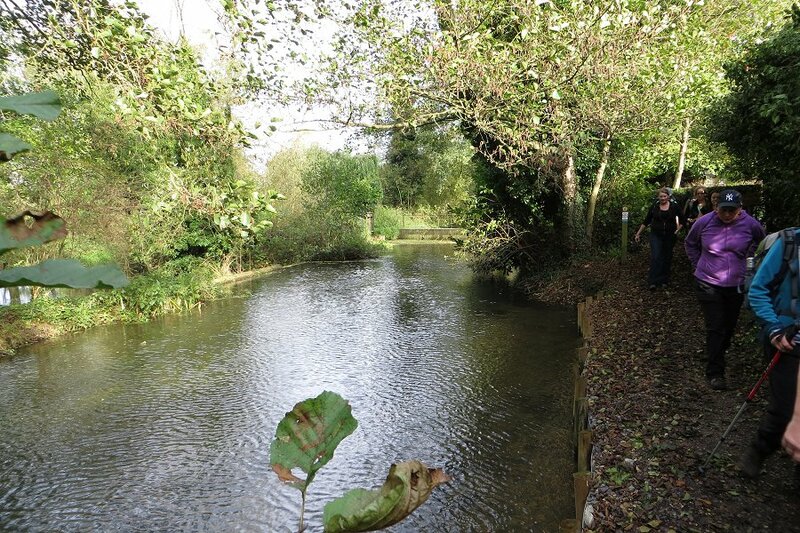 Crossing the Kennet and Avon near Newbury and Speen. 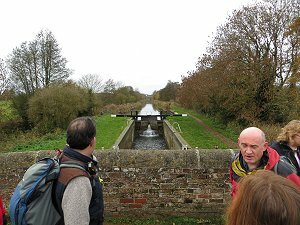 Sunday 1st December saw eleven of us assemble outside St Nicholas Church in Newbury town centre, ready for an eight mile urban and country walk. 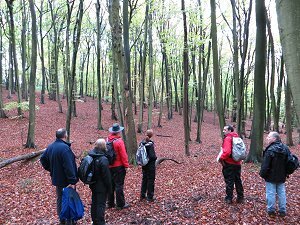 An additional feature of this walk was that Mike, the leader, had prepared a few quiz questions relating to parts of the walk. We started off following an alley way beside the church that took us on to the towpath of the Kennet and Avon Canal, heading west. After about a mile, we crossed over the canal and then over the River Kennet and north towards the village of Speen, stopping off to admire the Saxon church of St Mary the Virgin - believed to be the oldest church in Berkshire. 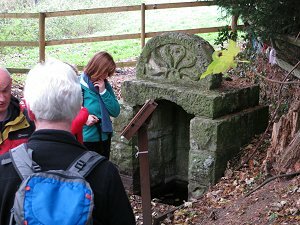 Ladywell, an ancient holy well near Speen. 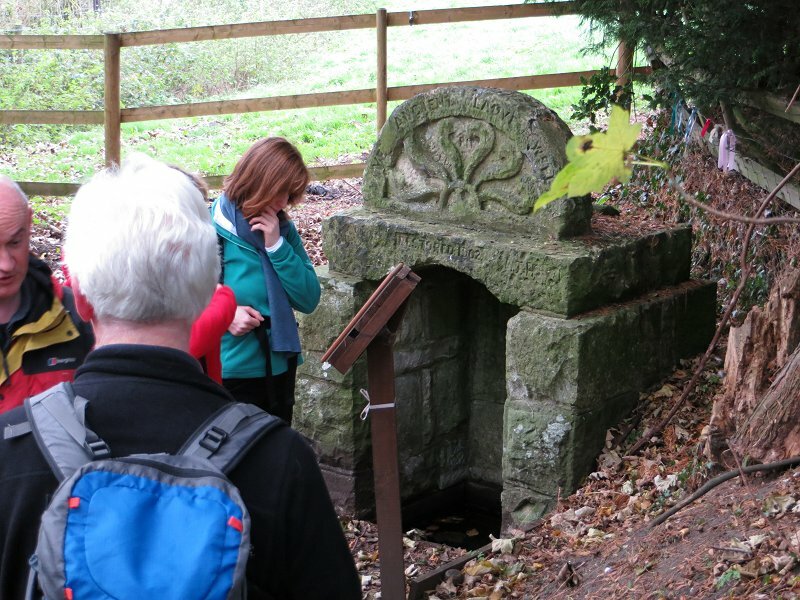 Next we stopped off to look at Ladywell, an ancient holy well just south of Speen. Crossing the A4 Bath Road in Speen we continued north toward Donnington, passing through a golf course and then crossing the River Lambourn before heading up to Donnington Castle. 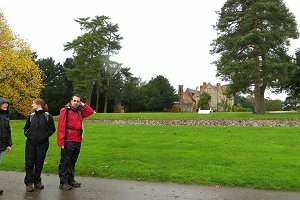 While we were wandering around the castle grounds, we were joined briefly by members of the Berkshire Walkers 20s & 30s group, who were also walking in the area. We continued north to Castle Farm and then, crossing a bridge over the A34 Newbury Bypass, up to the edge of Snellsmore Common. 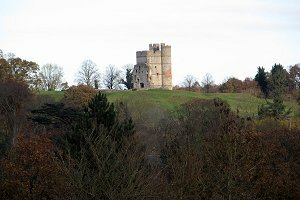 Donnington Castle. As seen from the golf course. Looping round and heading south we headed to the village of Bagnor, where we stopped for a drink at the local pub. Refreshed, we set off following the Lambourn Valley Way eastward, crossing another bridge over the A34 and passing Donnington Castle again. Crossing the River Lambourn again, we took an urban route back to Newbury town centre where the walk finished. Some of us stopped off in town for a coffee and cake before going home while others went off to do a bit of shopping. Take a look at our route on Bing Maps. Approaching the statue of King George III on horseback atop Snow Hill. 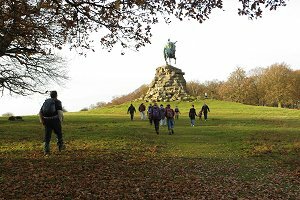 Winter sunshine brightened up the morning of Saturday 14th December as fourteen of us congregated on Ridgemead Road, ready for a six mile walk around Windsor Great Park. 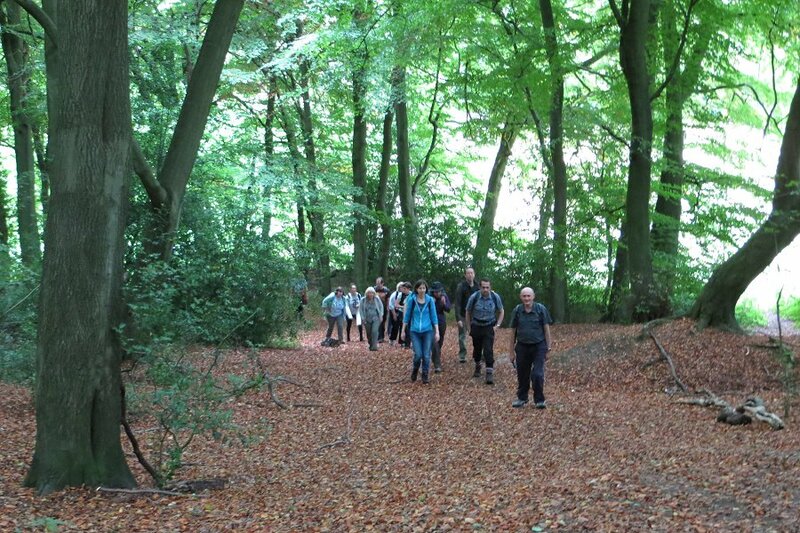 This walk was held jointly with the Chiltern Weekend Walkers and Maidenhead Walkers. Setting off along a quiet road to the Bishop's Gate, we entered the Great Park, where we followed some of the well maintained paths taking us to Snow Hill, via Spring Hill. The Long Walk to Windsor Castle from Snow Hill. 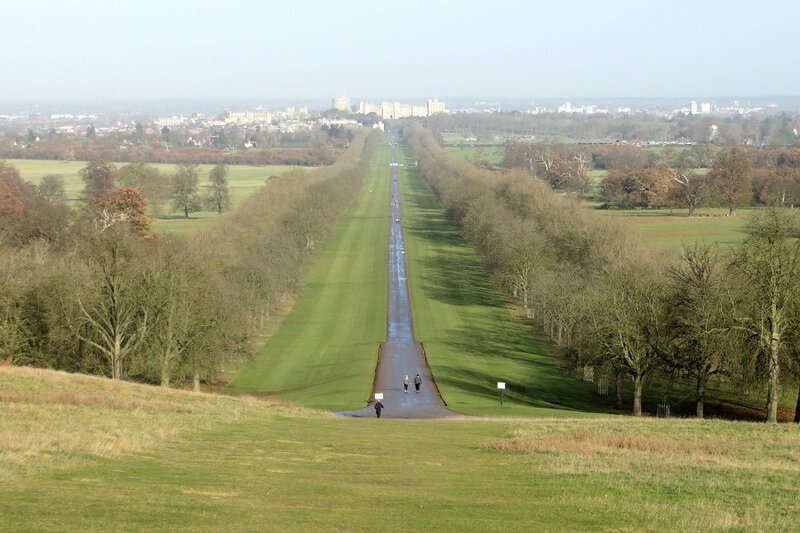 We stopped at the top of Snow Hill to admire the statue of King George III on horseback, and to admire the view of the Long Walk to Windsor Castle. Instead of taking the Long Walk we went in the opposite direction along the Three Castles Path as far Cumberland Lodge, passing the Royal Lodge on the way. 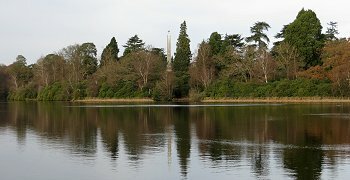 Approaching the Obelisk and its Pond. At Cumberland Lodge we departed the Three Castles Path, taking a series of path through the park and towards the Obelisk and its pond. Circumnavigating most of the pond, we then stopped off at some picnic tables by the obelisk (a memorial to the Duke of Cumberland) to have our packed lunch. Those who hadn't brought a packed lunch with them were able to get hot food from a nearby kiosk. After lunch we made our way to the Savill Gardens. The group split up at this point with some choosing to have coffee in the restaurant before visiting the gardens. 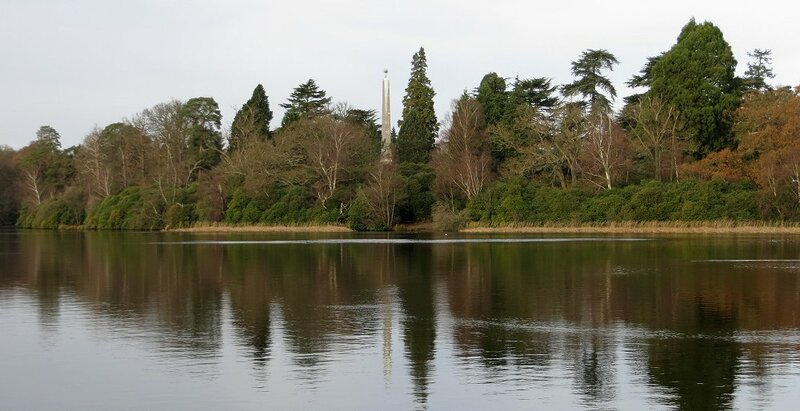 Circumnavigating the Obelisk and its Pond. 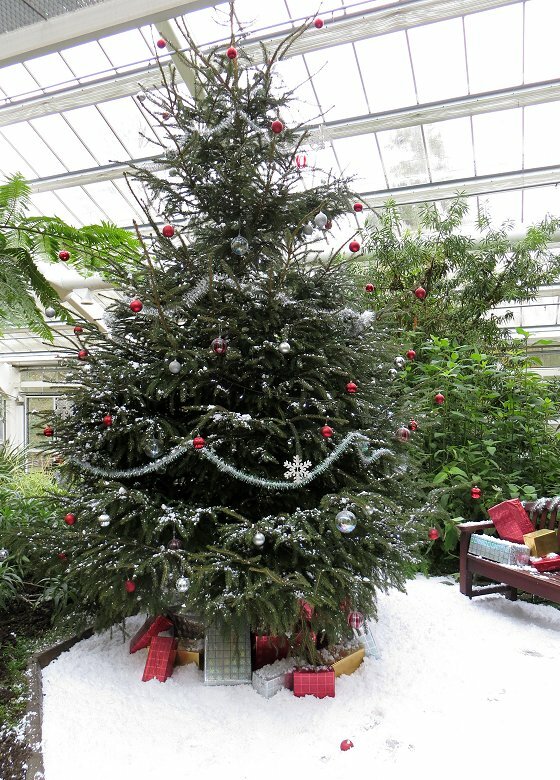 A snow laden Christmas Tree in the Temperate (glass) House. Entry to the gardens is free at this time of the year as there isn't quite so much to see, but there were still some autumn colours to enjoy and the gardeners had worked a little magic with some artificial snow in the Temperate House. Having explored the gardens, we made our way through Chapel Wood, back to Bishop's Gate and then retracing our route back to the cars. 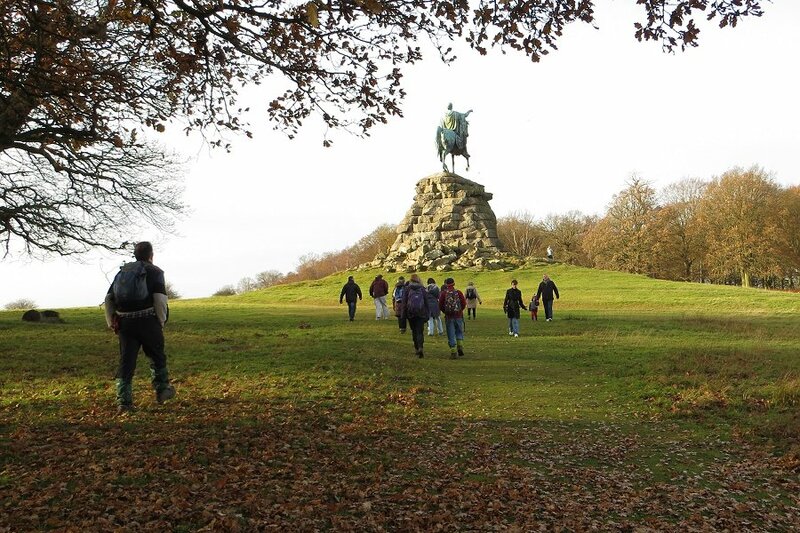 This fairly short walk included many of the varied features that make up Windsor Great Park. 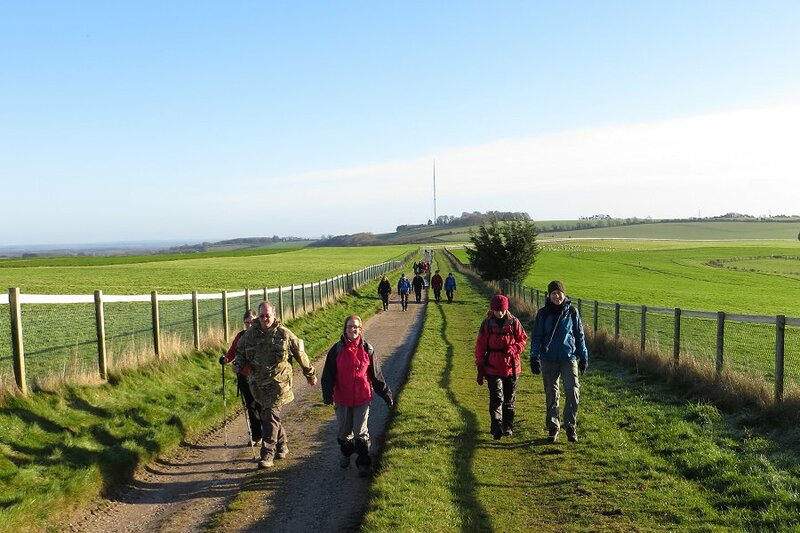 It also gave us a chance to mingle with two of the other established walking groups in the area. You can see our route on Bing Maps. Following the Thames Path from Bourne End to Marlow. 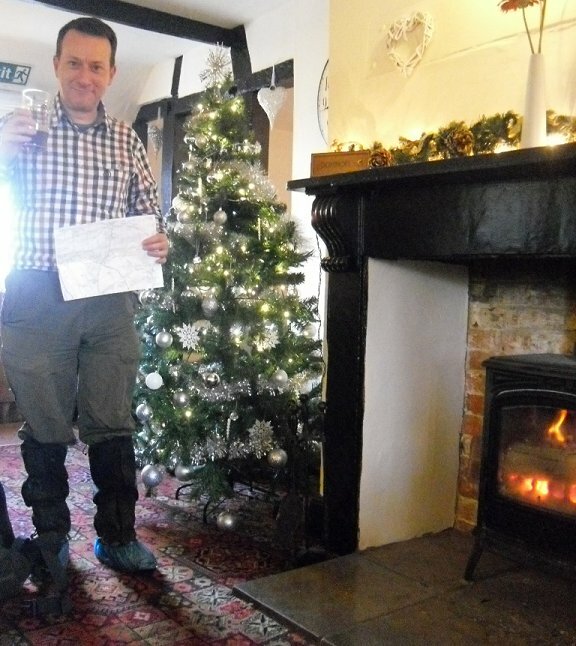 Sunday 22nd December was the day after our Christmas pub crawl of Reading, held jointly with the Berkshire Walkers 20s & 30s group. For that reason, this walk started at 11:30am, a bit later than our normal start time, to give people a bit more time to recover from the night before. We had fourteen people turn up, including some of us that wouldn't have made it without the later start! It was also a nicer day than expected, with sunny intervals and no rain. It was still very wet under foot and the waterproofing of our boots was tested several times along the way. 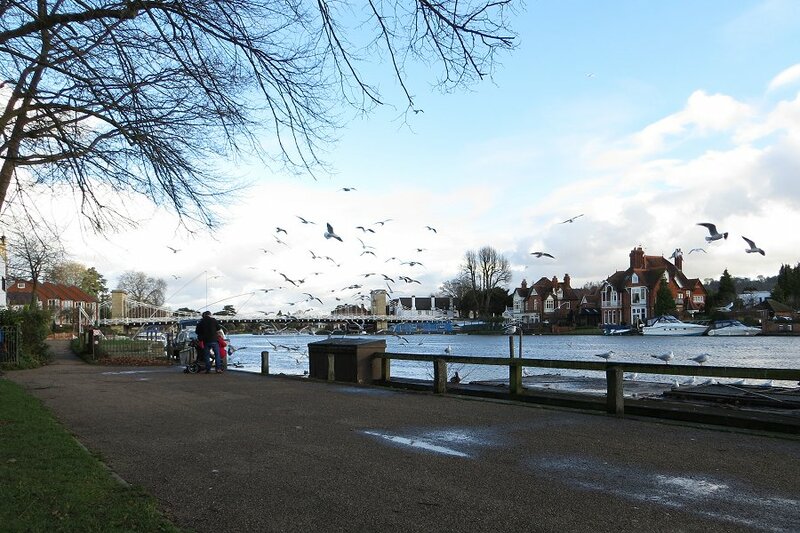 The Thames by Higginson Park in Marlow. The suspension bridge can be seen in the background. 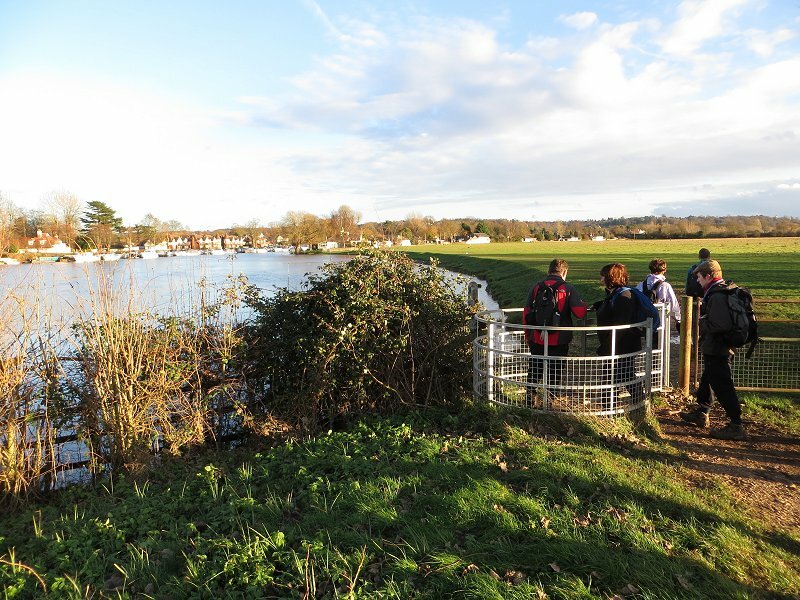 Setting off from the public car park at Bourne End, we followed the Thames Path westward to Marlow. This was a straightforward route, ideal for those recovering from yesterdays excesses. We passed through several fields of slushy grass along the northern bank of the Thames, with good views of the variety of fancy houses on the south bank. After passing under the A404 we arrived at Marlow, where we went through side streets and alleyways to Higginson Park. This was our lunch stop. Those with packed lunches went and found park benches to sit on while others went to the café for something hot. 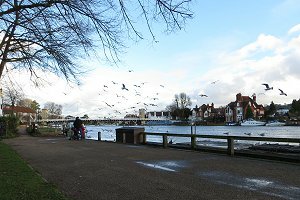 A couple of us went down to the river's edge where we ate our sandwiches under the watchful eyes of the herring gulls, ducks and a solitary goose. View of Bourne End from the south bank of the Thames. During lunch we were joined by a regular guest of our group who had already done a 16 mile cycle ride before joining us! So fifteen of us crossed the suspension bridge over the Thames, and in doing so we crossed from Buckinghamshire into Berkshire. Following a road under A404 we entered Quarry Wood and took a rather steep path up onto Winter Hill. Emerging from the woods gave us a clear view across the Thames to Marlow. Descending Winter Hill we followed footpaths that took us to the south bank of the Thames, which we followed easterly, passing some riverside residences until we reached the railway bridge. We also passed a riverside pub, but decided that we'd had enough alcohol already this weekend and didn't go in. Crossing the river back to Bourne End we then followed the Thames Path westerly, returning to the car park where the walk had begun. The sun was still shining and we'd escaped the predicted rain. See our route on Bing Maps. Walking along the Wayfarer's Walk on the top of Watership Down. 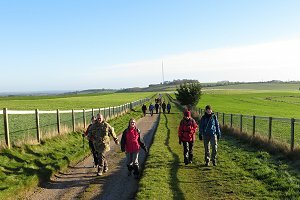 Sixteen people turned up on Saturday 28th December for our last walk of the year. 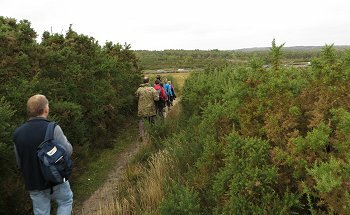 Two of these were guests from the North Hampshire ramblers group and another was trying us out with a view to joining. The weather was sunny, but a little cold at 6°C, with none of the wind and rain we've had recently. 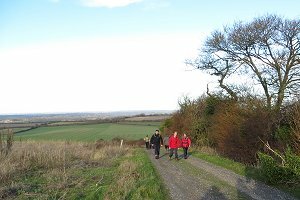 We set off from the car park at the top of White Hill and followed the Wayfarer's Walk, gently up hill, along the top of Watership Down. After about a mile we crossed the gallops, giving way to a solitary horse rider and began to descend the steep slope on the north side of the down. Descending the steep slope on the north side of Watership Down. 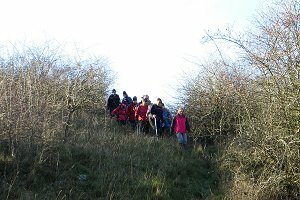 Cutting through a piece of woodland, we followed a couple of muddy footpaths (with ice on some of the puddles) and joined the lower gallops. No horses on these gallops - just dog walkers. A bit of road walking took us east, through the southern tip of Kingsclere village and on to a track called Hollowshot Lane. After about a mile, we left the track and turned south, following a footpath that led us up Cottington's Hill. As the path levelled out near the top, we stopped for our picnic lunch. 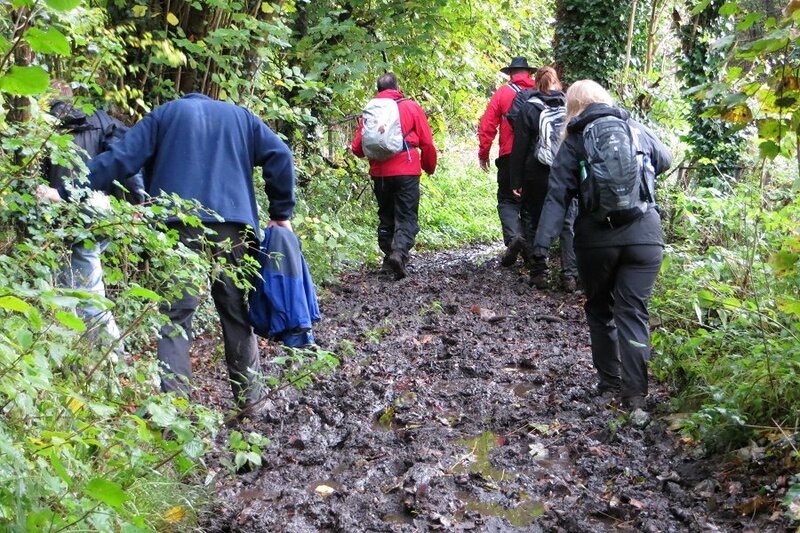 After lunch we continued on our way to Hannington village, which involved more ups and downs, and quite a bit of mud. Inside the Vine pub in Hannington. On reaching the pretty village of Hannington, we made our way to the Vine pub. Muddy boots were removed (or covered in plastic overshoes) before entering the pub, so as not to ruin the carpet. Inside was a wood-burning stove belting out some welcome heat. Sitting on a leather settee by the fire with a pint in my hand, there was a great temptation to stay, but we finished our drinks and continued our walk. Ascending Cottington's Hill with Kingsclere in the background. Boots back on, we left the pub, heading past the green and the church before taking a footpath north out of the village. A bit more road-walking took us back to Cottington's Hill and to the TV transmitting station, whose mast could be seen throughout most of this walk. From there it was less than a mile, down-hill, back to the car park. Although we encountered a few fallen branches on our route, there were fewer than expected considering the recent storms. With a total of 270m (880ft) of ascent over the 8 mile walk, we had a good work-out and hopefully burned a few of those Christmas calories. See our route on Bing Maps.